I have been training for 10 years now; since I was about 14 years old. I weighed 135lbs at 5 foot 10. Since that time I have been training and eating my way to a bodyweight that slammed in at 320 lbs. Yes I have always been an athlete all my life. My sports were baseball, football, and basketball. Lettering in baseball and football, and then pursuing the two in college. I was a stand out athlete, but my training always came first. So much so that injuries that had arose from over training, and always playing at 110%. IM the type of person who gives every thing they have to the goal at hand, I was never taught to play at 70 or 80%. To me that is just being lazy, this mentality has helped me to achieve a lot of great things, but has also beaten my body up pretty bad. I had built up some major injuries which included meniscus damage to my knee, nerve damage to my shoulder and spine, and a rotator cuff that was so sore I couldn't sleep at night. When I was about 19 years old my friends told me I had to start competing in bodybuilding because I was so damn big and ripped. So I tried it out I ended up placing third in a comp that had 5 guys in it. I didn't think much of it, but I did get noticed and people told me of another bodybuilding competition that was 5 weeks from that one. So I decided hey I minus well do it. So I did, it was the AAU Mr. /Ms. 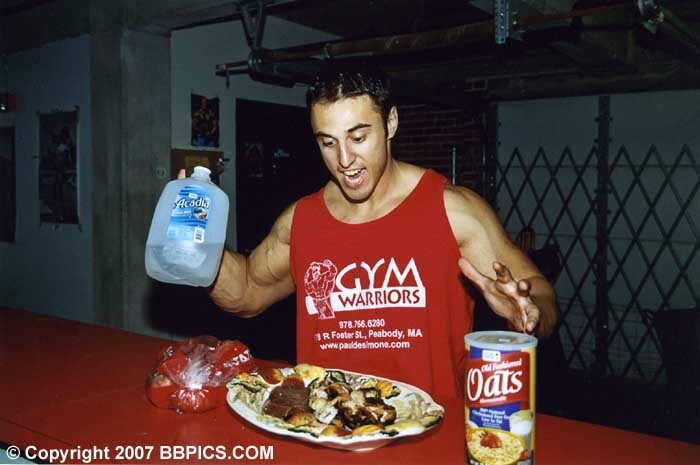 Massachusetts Bodybuilding Championships in Worcester, MA. I competed, it seemed no one even looked at me till I took my shirt off, when I did all the competitors kept coming up to me asking how old I was. I won that show took the overall and ended up qualifying for the nationals which I went on to. The Jr. Olympics, where I placed 4th in the tall class. This comp was a very disappointing point in time for me; because I was so built up I was really in great shape and way bigger than any one there. All the competitors came up to me telling me I won. It was a surprise in the end finishing 4th. From there my bodybuilding career went solely to getting bigger I mean a lot bigger going up to 320 lbs from 210 ripped. This was very hard on me but I handled it well, eating every 30 min. For the past 2 years I have taken my training serious. From putting all that weight on I have tons and tons of mass so I have been working on ripping it all up. I still have a problem with looking watery the only thing that has held me back. When I finally master how to get rid of the watery look I will be a pro; count on it. I also have been acting, and making movies/ work out videos which are for sale. I was recently in a movie land of the college prophets where I was in about 30% of the movie. I played the lead villain, Third Reich Jones. The movie was playing in NYC and is now playing in Boston. Look for it. I also was on fox's you got to see this, and fox's infomercial green magma. I am in a new book out called the encyclopedia of underground movies. You can purchase the book at Borders, and on Amazon.com. I am building a website called Paul DeSimone it will be up and running soon. I also have made informational work out tapes so that you can learn how I train. Email me at xxtralargemuscle@aol.com. If you're thinking about shooting with John I must urge you too do so. Not only is he easy to work with, he's a good guy. Down to earth, and funny, and this is not John writing this. John will work with you not against you, I saw him do it with me and my work out friends. Just work with him you'll reap the benefits. Bodybuilding, modeling is all about self promotion, take it from me, you got to do this stuff to get noticed. No one comes to you and says hey I like you and here is a contract. You got to go out there and get it yourself, so do it, if you need motivation buy my video. I just finished a photo shoot with him but I had spent some extra time with John talking and showing him around my gym, and introducing him to lots of different people. Look at John's work he's not trying to waste your time, he's not trying to waste his time, so if he thinks you look good listen to him. All I can say is if you haven't worked with John then you're missing out. If you are serious about getting into shape then contact me I will help you and guide you all you need is the money and to listen.